I hope that Qt will be the framework to build crossplatform mobile apps. Ports for the Android and iOs systems are already in work. Killer ! Thanks. Great step by step ! Twitter supports it, so you don’t need to write a proxy. Just give it a callback function name and deal with the return value on your client. Still, that technique sounds like a very dirty hack since JSONP seems to abuse the <script> tag, which can access ressources hosted on servers from different domains. Yeah, it’s definitely hackish, but it seems to work universally enough to count on. I don’t imagine that browser manufacturers will be plugging the hole anytime soon now that so many sites use the technique. You can even do comet and JSON-RPC over JSONP. Just make sure that the library you use to abstract the browser differences in invoking JSONP doesn’t simply do an eval() on the response if you want to avoid XSS attacks. As you said, Twitter seems to support JSONP, so I’ll drop a note on that in my tutorial on the ajax call. However, I am sure there are sites/services out there which do not support it, so I think it’s a good idea to leave the explanation on the proxy-technique there. Seems like jQuery’s ajax() method accepts an additional parameter, which flips on JSONP support and automatically does an eval() on the result data. I hope the library is smart enough to handle the XSS attacks you mentioned. If you wanted to package something like this up as an app in Phonegap (for example), would you be putting an absolute URL in for the proxy? After thinking a bit about it, I fear that the answer must be yes. If you don’t hard-code the url to your proxy-service, the question must be: Where else could you get it from? Loading it dynamically from a service only relays the problem because you’d then have to store the absolute url of that service again somewhere. The only solution I see is to check if the SDK you use provides a solution for that, like e.g. built-in proxy functionality for Ajax calls. Unfortunately, I don’t have experience with Phonegap so I can’t tell you if there is such an API call. I’v bin strugling some hours now with the not working click-event on my iPhone now :-) Thanks for the good work! but some confusion in joining the parts of source code..
can you please send the source code of this tutorial in some zip folder so that i can run it easily………. Nice tutorial, quick question. How are you hosting this app (iphone)? Can you put it in the app store? I dont understand how you can use PHP with it because iphone doesnt support php? 1. 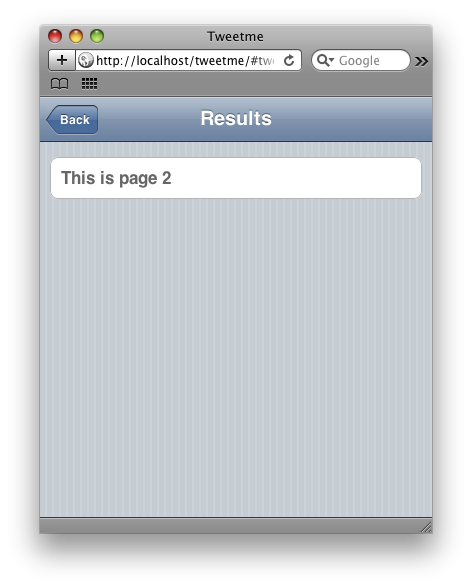 Host both, php and jQtouch app on a web server, so everyone can use it through a webbrowser. 2. Package the jQtouch app into a native app using the native browser component, that’s build-in into most SDK’s. Of course, the PHP proxy must be placed somewhere on a dedicated webserver that supports PHP. ahhhh ok thanks for the info, I understand part 1 but would you mind explaining part 2 a little more in detail? basically you use the native SDK for the mobile platform you’d like to develop for. For iOS, it’s Xcode + iOS SDK. 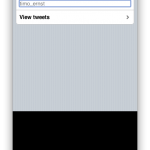 For Android you should use Eclipse + Android SDK. 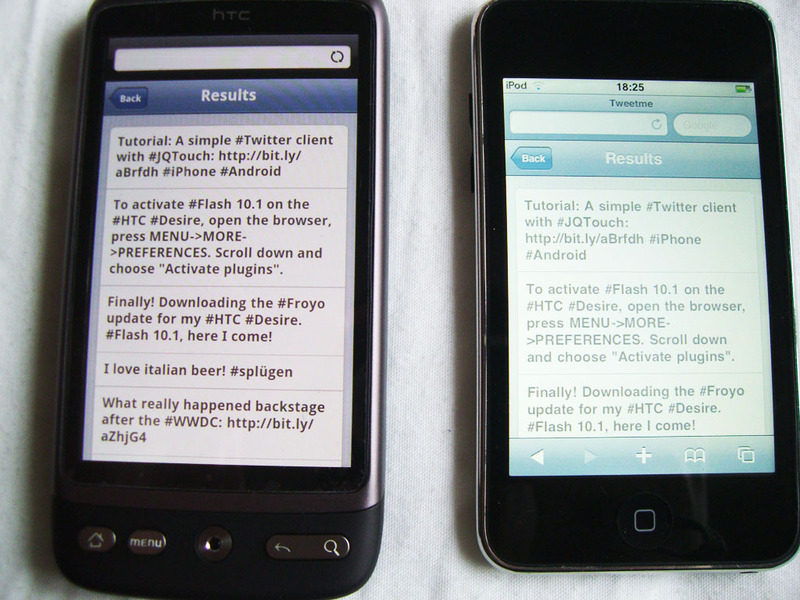 Similar setups for Windows Phone 7 and Palm OS. Of course, you’d then have to create a native app for each mobile operating system. If you have no experience with both, I suggest to read some tutorials to get some basic knowledge. To host your jQtouch app, you build a native app (with the SDKs mentioned above) which consists only of a browser (inside the app). When the app starts, you let it load the jQtouch site. Of course, you’ll have to package that into the app as well. Once you’ve done that, your jQtouch application should be already able to run (inside the “native browser wrapper”). BUT since you probably have no PHP interpreter on board, you’ll have to host the PHP proxy files on a dedicated web server which can do that. Your jQtouch app should then call this service whenever it needs to. (Tip 1: If you don’t want to create a native app for each operating system, I recommend to use Adobe AIR as the “wrapper application” since it already has a build-in webkit-based browser. AIR is available for most common operating systems and gives you the ability to create cross-platform-apps using one codebase). (Tip 2: If you don’t want to host the PHP service on a dedicated server, you could use Phonegap http://phonegap.com and do the webservice calls using the native library). Wow you sure know a lot. 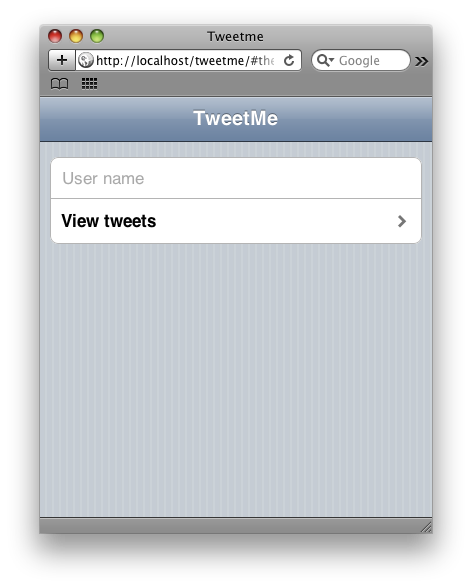 I have made phonegap apps before and I do use xcode + sdk. I guess I just don’t understand how to get php working. I was wondering if you would like to chat more over email instead of clogged up your comment wall? I’m trying to have the return a form using ajax and then submit that form again, but it breaks for some reason. I want to go form – > form – > form – > form… my php page reads the querystring to determine the next form to display. how would I adapt the ajax or the functions to make this possible? Hey, could you provide some example code and explain your problem a bit more in detail? What do you mean by “have the return a form” and why are you trying to re-submit the form multiple times? QUICK QUESTION? Now how do i get this instaled on a phone? 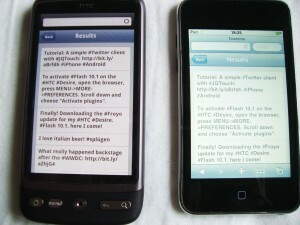 what are the formats it should be in o wrk on both iphoneand android and how do i go abou that? you simply create an app which only consists of a browser (there are components for that) using the native SDK’s for iphone/android. How to have working link in twitter post? I found this and it works! Good tips and thank you!!! Could you tell me how can i display the date and time of the tweets? Hey I downloaded your source code, and clicked on index.php but it didn’t work. Anything that I’m doing wrong? I also created a file called index.html with the content of index.php…but still nothing. All I get is a dark background with the simple html code. Just one question: can I link a website to view page 2? Like if I clicked on “view page 2″ could it take me to google etc? 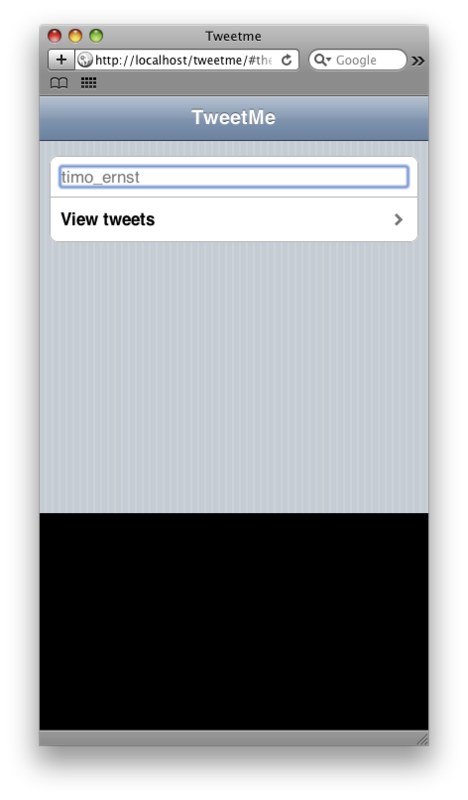 I tried replacing the href=”#tweets” with href=”http://www.google.com” but it didn’t work. Any suggestions? Thanks a lot buddy! It worked! 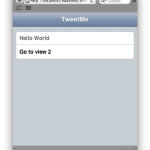 This framework is great for creating cross-platform web apps. What about if someone wanted the links that are included in some tweets to be active? You mean “clickable”? If yes, you’ll probably have to use regular expressions and replace all URL’s with the corresponding HTML <a …>foo</a> tag. Great tutorial. Thanks so much! May I ask you What enphasis your Diploma have? My emphasis was primarily user interface engineering. Besides that, in my diploma thesis I wrote about performance measurement techniques for Rich Internet Applications. Did you exactly copy+paste the code? If yes, it could be that there is a “)” character somewhere in the variable “d” which causes that exception. Hey – just a note that if you want this to work on both ios and android devices, you should swap ‘tap’ with ‘touchend’ when binding the click handler. Thanks for the tutorial! I tested on both, iOS and Android and it worked fine. As far as I know, “tap” is for iOS and “click” works for Android. I’m interesting in mobile application development. mainly I’m web and graphic designer I know about HTML, CSS, JAVA SCRIPT, JQUERY and related printable software. Give me some idea and brief about iphone. sorry but I’m currently not interested. what is the first learning step for mobile app. please share with me some link like mobile app tutorials and learning book(pdf). .
That depends on the technology you’d like to use. I usually start with the online documentation of the library/frameworks (Google search). Then, buying an appropriate book on amazon would be a logical next step (just use amazon search). If available, I also often watch screencasts but those are rare. 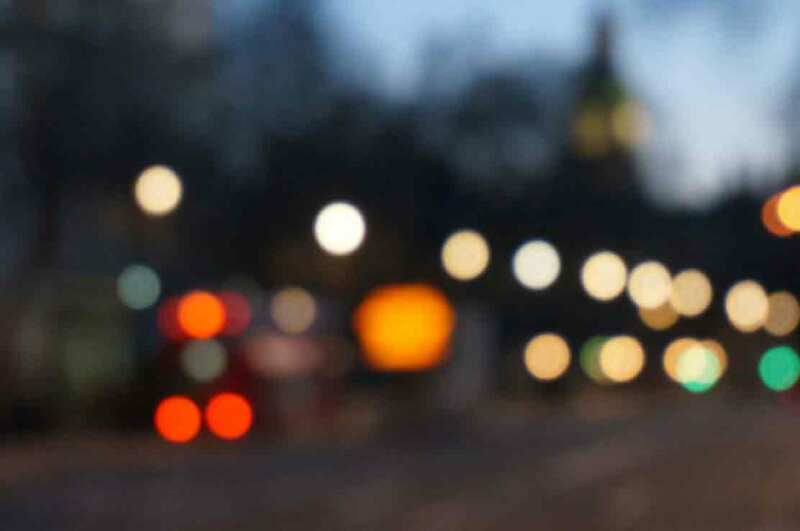 Hi, i am new in JQuery and JQTouch. I am creating dynamically runtime table rows. then i am adding click event on these rows. which should call an method to get some data for new DIV(#report). i am trying both way..but those some times can work and sometimes not working, i mean click event are not listening always… in my mobile safari browser. each row contains three div. each div contains i want to click my row go to the report div and also need to execute a mehtos. beacuse the report div contain diifrent data based on selected row. Thanks . please need help. If we are to make this application without using Browser i.e standalone app, then using which technology we can do that. I am planning for an app which will have thin client like any mobile banking software, and in server side there will be a java code which will run on tomcat server. The server side code will still be done by me and i won’t be using web service. Can i still go ahead with phonegap? Phonegap has nothing to do with server side logic. It’s pure client-side technology to wrap HTML5-apps into native apps. Usually, I’d suggest to bind server and client via a web service but since you stated that you wouldn’t be using a web service, how would you bind both together? Is there no other way to do this without using web service? Please also keep in mind that I don’t know anything about your project or your setup so the suggestions that I make may not comply with your requirements. But Just one last question. 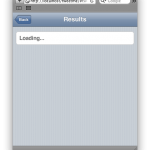 will web service make the app slow? and is it easy to implement web service and then call that web service from tool like PhoneGap. Well, you have to poll your server somehow to get your data or not? So performance doesn’t depend on having a web service or not but rather on (A) the speed of your server and (B) the efficiency of your implementation. Well, I personally find web services to be easy to implement. I don’t know what and how much you know about that topic. Calling a service from your app is very simple. Just do a normal ajax call with jQuery (see http://api.jquery.com/jQuery.ajax/) and you’re done. This is a great howto. I wonder if it’s possible to have some alter in your phone that when you have a tandard account you want to check… a “popup” or whatever is shown in your screen. 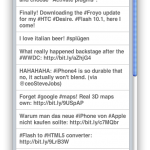 I wonder if such app from phonegap can run in the background for this… would be awesome! Can u give me sample example on web services with ksoap2 on android platform of client side using phonegap.